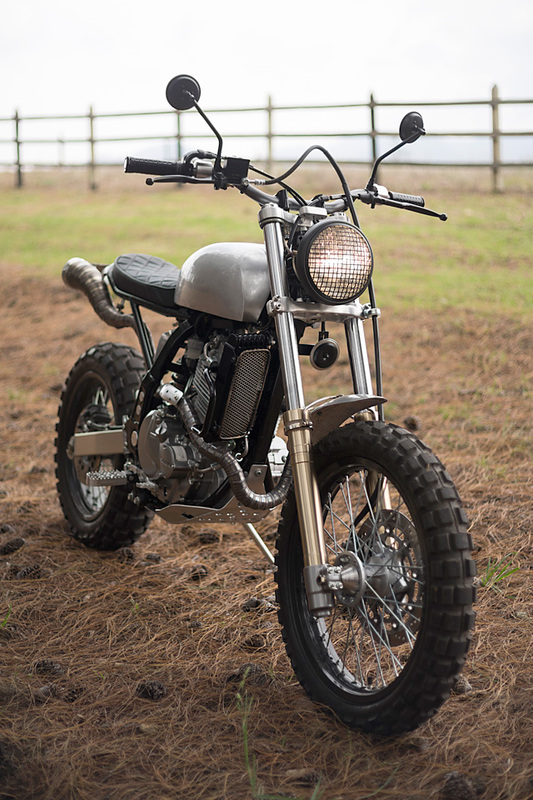 We are proud to say that the build started here at Pipeburn – well, kind of. 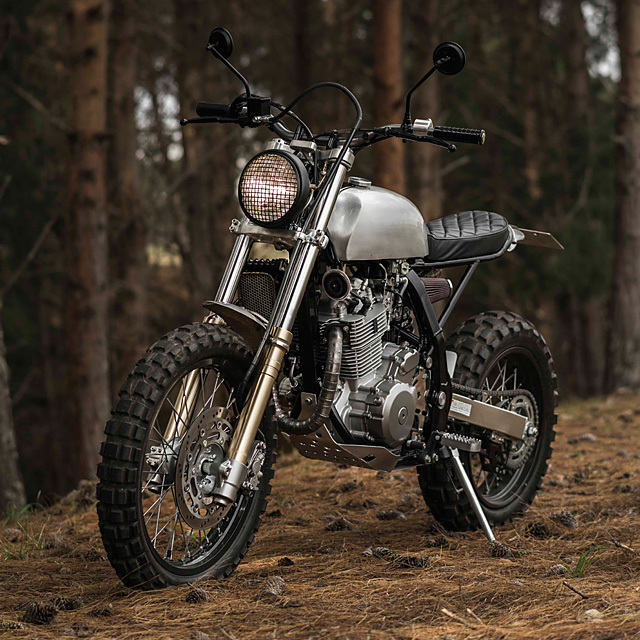 After we featured their last KTM 390 Duke, the brothers were contacted by a customer who wanted them to build something similar. 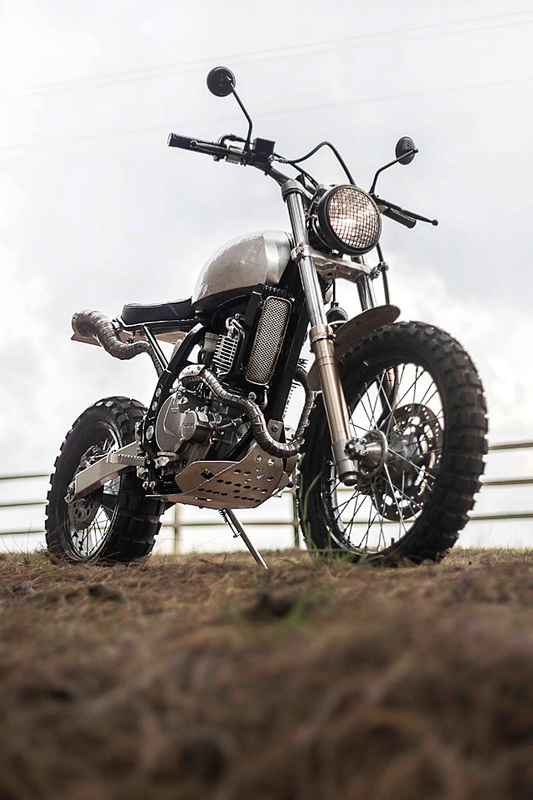 “The idea was to create a minimalistic bike with a touch of classic essence, continuing with the series of the three bikes that have our interpretation of classic tanks, starting with Silver Arrow and the peanut tank,” says Esteban. One of the most iconic parts of the Triumph TRC6 is the exhaust system, so Pasquale created a unique exhaust system in stainless steel. 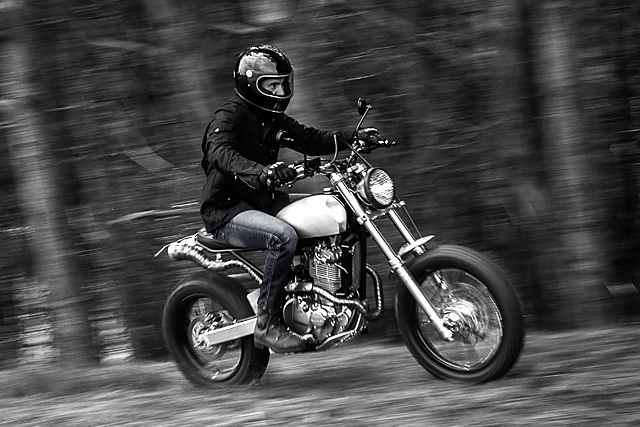 The exhaust was made using the back purge method and has more than 70 pieces that twists and turns around the bike like a snake – hence the name Mamba was given to the bike. The exhaust has been finished with a GP style slip-on and to add the ‘Pasquale touch’ their father milled the top end of the slip-on in 7075 aluminium. To maintain the clean look, they made three tiny aluminum mud guards with stainless steel clamps and Papa Pasquale worked his magic again and milled the final drive cover. For the seat, the idea was to create more volume, so they went with the classic looking diamond pattern in black leather. 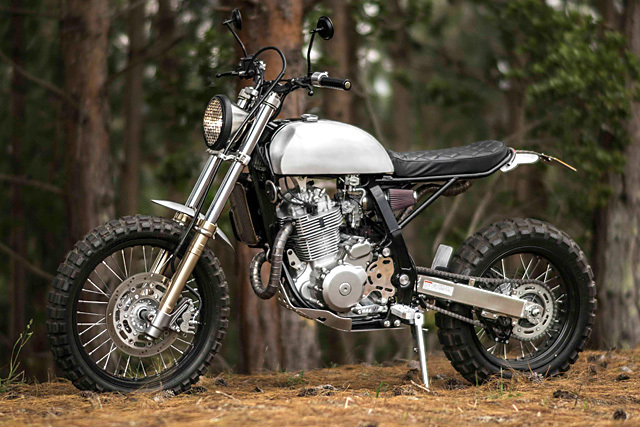 The seat also became the perfect spot to hide all the electric system of the bike and hold the Shorai battery. The other lovely detail of the seat is the flexible tail light with an aluminum cover and a stainless steel bracket for the license plate. 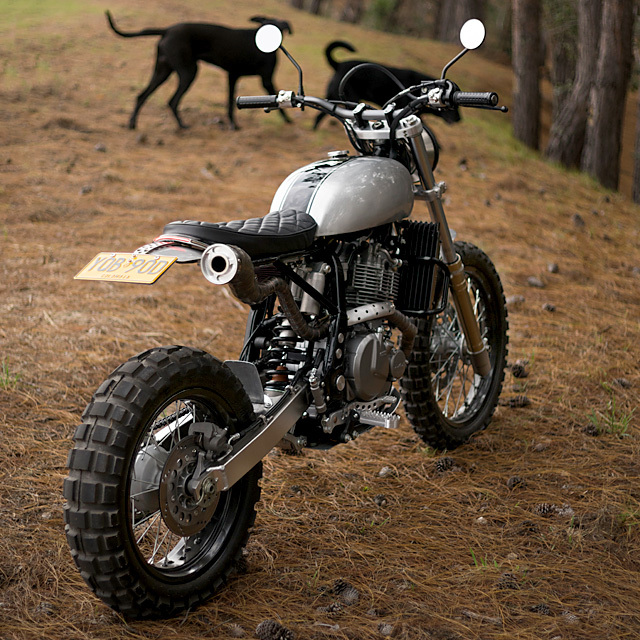 To give the bike more off-road capabilities, Pasquale created a skid plate with the same hole pattern as used on the license plate bracket. 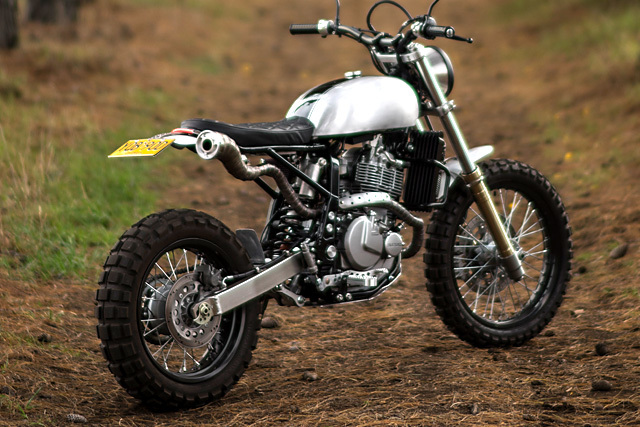 Maintaining the same design line, they also milled new foot pegs with aluminum foot brake levers, gear levers a custom aluminum side stand to give the bike the perfect rest position. For the front of the bike they wanted a low and minimalistic look from the rest of our bikes, so Pasquale milled by hand from a solid piece of 7075 aluminum, the triple clamp with the moto gadget on it. 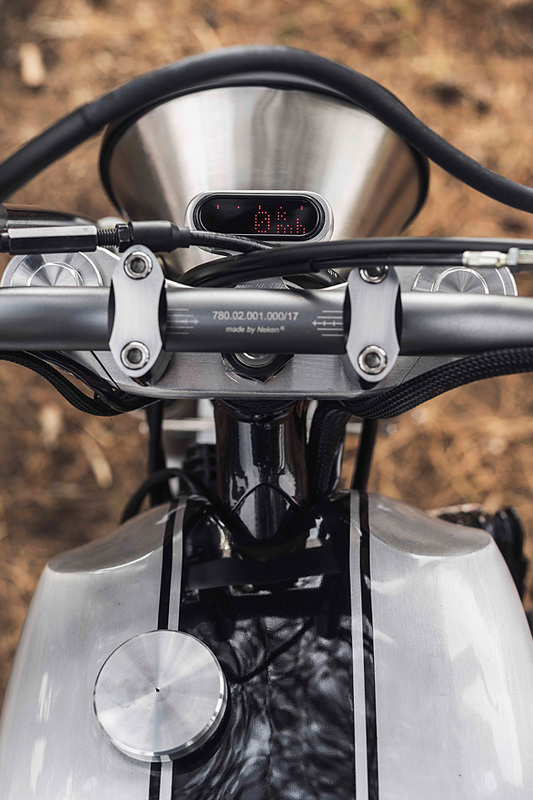 They also created a headlight made of stainless steel that maintains the low profile of the bike that is clamped to the triple clamp with an imperceptible round bar. To finish the bike off and give it the final touch, they made special controls in aluminum as well, that has three buttons and for the grips we used the Japanese posh waffle grips. 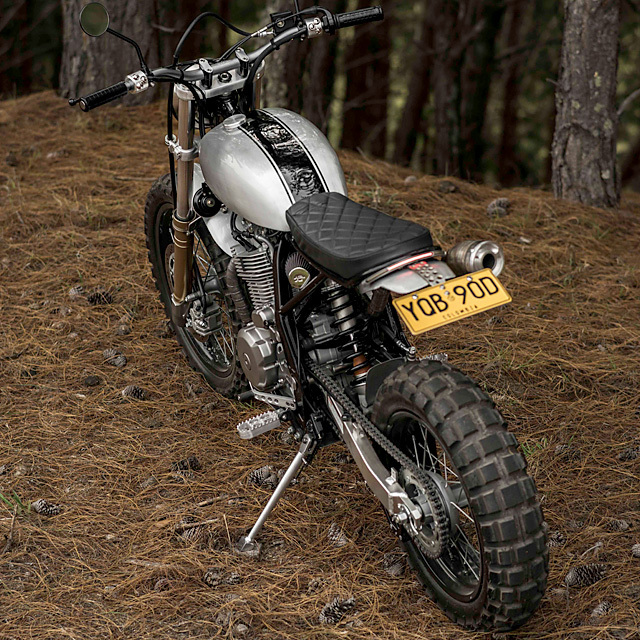 Pasquale Motors have taken the stock DR650 and turned it into a tough assault scrambler. 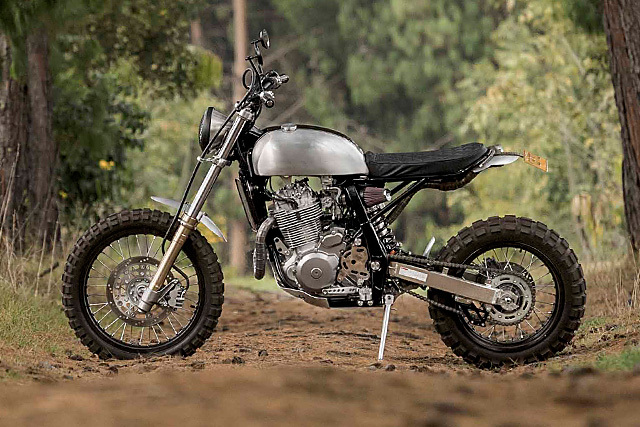 The ‘Mamba’ looks like it’s ready to attack the forest trails of Colombia, or even the urban streets of Bogotá – while looking damn good doing it.